The casting is important as it corrects the position of the foot. When your baby is born the casting process should start as soon as possible to maximise the chances of success. I would recommend a doctor who strictly follows the Ponseti method and is recommended on the webpage www.ponseti.info. I have read that some doctors who believe they are following the Ponseti method may not, in actual fact, be following it. It is important that the baby's clubfoot is not just corrected, but is over-corrected by means of a series of casts, usually changed weekly. The over-correction has to extend the foot beyond the central line, outwards (see photos below). The foot should not be cast straight and pointing upwards. The point of the over-correction is that the tendon is stretched - try with your own foot - bend it away from the body and you find it does not hurt and it stretches the tendon at the back of the leg. The casting position may look awkward, but it is natural and does the job of stretching the tendon without damaging the foot - putting the foot in a straight line and pulling the toe end up to stretch the tendon will cause problems. Find a good doctor (even if it means travelling a long way) and familiarise yourself with the ponseti casts (see links) so you know what should be expected. The cast should cover the whole of the leg. We have found that a cast with a good opening for the toes is best. The baby will tend to kick and cry a lot during the casting process. It is best to get the baby use to using a bottle aswell as the breast. Pump some milk and then try and avoid feeding a few hours prior to the casting. When the doctor starts the casting give the baby the milk. By the time he has finished feeding the cast is almost on and you only get minimal tears. You can also breastfeed during the casting process, but this makes the positioning difficult so is the second best option. Of course, if casting two feet, it becomes more difficult as the baby has already fed during the first cast - hopefully he'll be tired! Bring a gauze cloth or two to cover baby during casting as he will not be wearing a diaper. ABOVE: The third to last casting. ABOVE: The second to last casting - note the way the foot is over-corrected to stretch the tendon. Over-correction should follow this position to avoid problems. When the cast is on, take care with the diaper such that it is above the cast so the cast does not get soiled. Also take care with diaper changes so the baby does not wet the cast. Disposable diapers are recommended to avoid soiling the cast (so the environment will have to wait for now). Bathing is difficult and we found that our baby tended not to enjoy the bath! 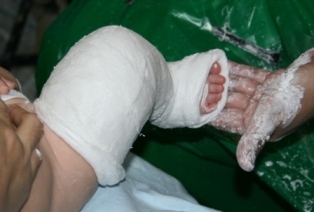 You just have to use a sponge/cloth and if wetting with water then take care not to get water on the cast. With two people, bathing was relatively easy. Watch the toes for swelling and if they go purple then see a doctor immediately. If they swell see a doctor and have the cast adjusted. Don't remove the cast until a couple of hours before you leave for the hospital. Even in the short few hours between casts the foot has a tendancy to move back towards it's original position. Certainly don't remove the cast the night before the hospital visit - remove it the same day. We were initially advised to add a small amount of vinegar (up to one third vinegar) to water (about two thirds) and then splash it over the cast. This took a couple of hours to pull and cut off the cast - we were not happy and neither was baby! 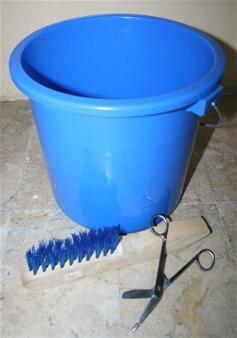 We have now improved the technique and use a small bucket which we fill with vinegar (at least one 4 liter vinegar bottle costing about $2). We then top the bucket up with hot water to get a comfortable temperature for the baby. This works out as 2/3 to 3/4 vinegar to 1/3 to 1/4 water. Having warmer water definitely helps out, but obviously the temperature must be comfortable for the infant. We then submerge the baby in the bucket up to his waist and hold him there. At the same time he is bottle fed to keep him happy (so don't feed him just before). You then peel the cast bandages off and the whole process should be completed in 20-40 minutes. Our fastest cast removal was 14 minutes start to finish! After the cast is off we give him a normal bath in water to remove all the plaster fragments and vinegar. 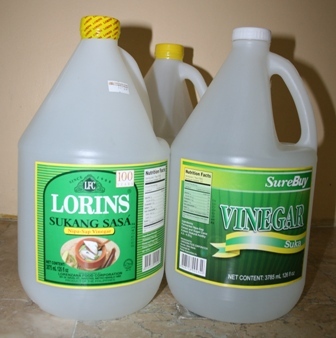 Because we are using more vinegar than recommended our doctor advised us to keep an eye for rashes or reaction to the vinegar. We have not had any problems, but it goes without saying that if the vinegar affects the babies skin then do not continue with it. In terms of tools to help remove the plaster, we tried all sorts and settled on a $1.50 pair of 14/15 cm medium bandage scissors made by Secheron, Germany. Anything similar with a blunt end will do. Plaster scissors proved impossible to get in the Philippines and were not necessary as bandage scissors did the job. A stiff brush is also handy to locate the ends of the plaster bandage. In the Philippines you can get the bandage scissors from Mercury Drug Store (may need to order) or National Bookstore. In other countries bandage scissors can be obtained online - try Ebay. For older children, with thicker casts, a bread knife or hack saw blade may be beneficial together with a stronger pair of blunt-ended scissors/cutters from the hardware store. Although these tools can be very useful you can minimise their use by having the correct amount of vinegar and using warmer water to soak the cast. ABOVE: The tools! Cost about $5 in the Philippines. Soak the baby up to the waist in two thirds (plus) vinegar to one third water. We put the bucket in another bowl to catch over-flow. Feed him to keep him happy. Peel the plaster off as it comes loose. Use the stiff brush to loosen the plaster and find the ends. Use bandage scissors where necessary. This cast was off in an amazing 14 minutes start to finish! Give the baby a bath using just water to remove any traces of plaster and vinegar. It's also his only thorough bath until next weeks cast removal, so make the most of it!